The percentage of Americans without health insurance continues to fall, measuring 15.9% so far in 2014 compared with 17.1% in the fourth quarter of 2013. 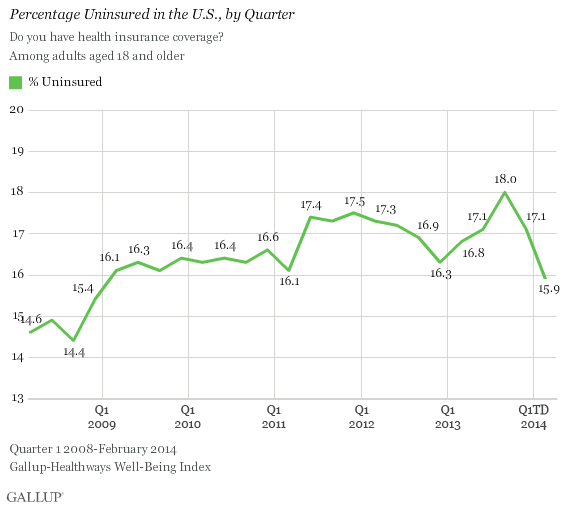 The uninsured rate for almost every major demographic group has dropped in 2014 so far. The percentage of uninsured Americans with an annual household income of less than $36,000 has dropped the most — by 2.8 percentage points — to 27.9% since the fourth quarter of 2013, while the percentage of uninsured blacks has fallen 2.6 points to 18.3%. Hispanics remain the subgroup most likely to lack health insurance, with an uninsured rate of 37.9%. These numbers remain lower than ultimately desired but do show a significant improvement, and further enrollment in the exchanges is expected during March, after the period of this survey. Further enrollment by young, healthy adults would be advantageous, but with enrollment at current numbers the Affordable Care Act would remain viable. Some states also had delayed implementation of Medicaid expansion due to initial political opposition by Republicans (with some states continuing to refuse to expand Medicaid). For example, Michigan is not accepting applications for the expanded Medicaid program until after April 15, 2014, which should further add to the newly insured. Most likely enrollment will also continue to increase substantially in future years. Initial implementation of the original Medicare program and Medicare Advantage plans were also hampered by problems and took time to get established. This year enrollment under policies provided under through the exchanges was hindered by additional factors including the initial computer problems and a campaign by opponents of the law to dissuade the uninsured from enrolling. Numbers regarding reduction in the number of uninsured would provide one parameter regarding the success of the Affordable Care Act, but there are many other numbers to look at. This includes no longer having people lose their insurance due to developing serious medical problems or losing their job, no longer having people denied health care coverage due to pre-existing conditions, no longer having people declaring bankruptcy because of losing insurance, the number of people who no longer having caps on health care coverage, the number freed from the “insurance trap” forcing people who otherwise do not need to work to continue working for insurance coverage, along with the overall benefits to the economy. The Congressional Budget Office Report, frequently distorted by Republicans, shows that the Affordable Care Act will reduce unemployment, help decrease the deficit, and allow more people to leave large corporations to start small businesses.